maribus gGmbH - „World Ocean Review“ (WOR) online. Nikolaus Gelpke, initiator of the World Ocean Review project and publisher of the mareverlag publishing house, established the non-profit company maribus gGmbH in 2008 with the aim of increasing public awareness of the interconnected nature of the diverse aspects of the marine environment and thus boosting marine conservation. The World Ocean Review 1 (WOR 1) was maribus’s first publication. IOI: The International Ocean Institute is a non-profit organization founded by Professor Elisabeth Mann Borgese in 1972. ”The Future Ocean”: The Kiel-based Cluster of Excellence brings together marine scientists, earth scientists, economists, medical scientists, mathematicians, lawyers and social scientists to share their knowledge and engage in joint interdisciplinary research on climate and ocean change. mare The bimonthly German-language magazine mare, which focuses on the topic of the sea. The result was a comprehensive, detailed and unique report on the state of the world’s oceans and their interplay with ecological, economic and sociopolitical conditions. The first World Ocean Review explains the key role played by the oceans in climate change processes, probes the uncertain future of our coasts, and reveals the mechanisms behind mounting marine pollution and misguided fishery policies. Yet, where there is cause for hope, this, too, is highlighted: the report presents the search for mineral and energy resources on the ocean floor that may be vital for the future, and the great prospects of deriving medical knowledge and active substances from the oceans. The World Ocean Review provides insights toward understanding the complexity of our oceans and the critical nature of their present state, thus bringing these concerns and the urgent need to respond to the forefront of public awareness. The World Ocean Review is not sold, but distributed free of charge. There is no commercial intent. The review is available at www.worldoceanreview.com. Beside the English-language version, there is also one in German. 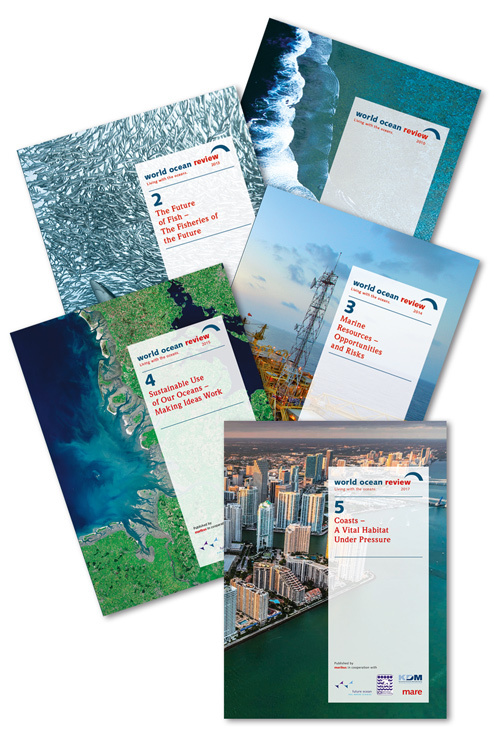 Since World Ocean Review 1 (WOR 1) maribus has already published three more issues.